New this year, alumni discount! 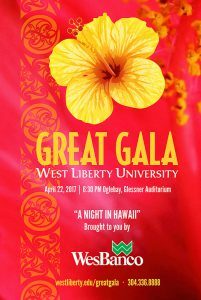 WEST LIBERTY, W.Va., March 16, 2017 — West Liberty University and its title sponsor, WesBanco, invite guests to enjoy a Night in Hawaii this April as the Great Gala takes on a tropical theme. The university’s major fundraiser, the Great Gala includes an evening of fine dining, dancing and entertainment, and will take place at 6:30 p.m., Saturday, April 22 in Glessner Auditorium, Oglebay Park. “WLU’s head football coach Roger Waialae inspired this year’s theme. He is one of only three Pacific Islanders working as an NCAA head football coach and we are pleased to celebrate his heritage,” said Vice President of Institutional Advancement Jason Koegler. A native of the island of Hawaii and resident of Wheeling, Waialae is a key member of Hilltopper Athletics and currently serves as co-interim athletic director. A Night in Hawaii will feature the authentic luau entertainment of Tuika’s Polynesian Island Magic of Pittsburgh, complete with hula dancers and Samoan fire dancers. Additional music for dancing will be provided by Wheeling’s own Mr. Fancy Pants. 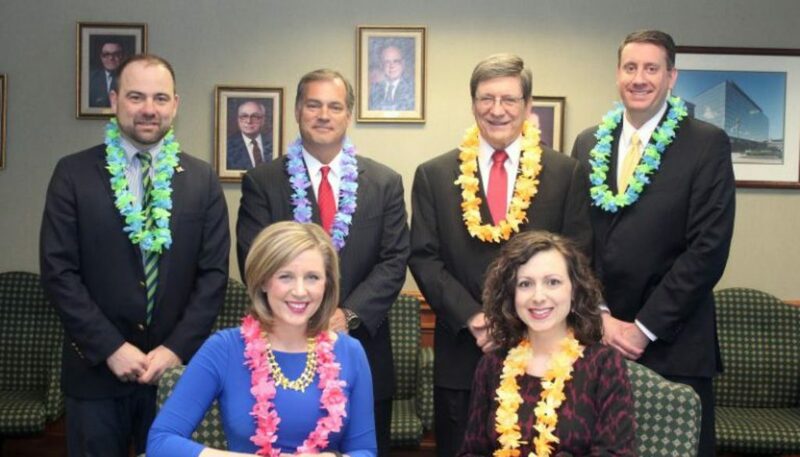 “The landmark Glessner Auditorium will be decorated to create the beautiful island magic of the Aloha State and all guests will be presented with Hawaiian leis and other surprises,” said Koegler. Dining will include a traditional luau menu and an open bar. Special Polynesian beverages also will be served. Now in its seventh year, the annual Great Gala has proven to be highly successful and typically raises about $40,000. All funds this year are earmarked for the Gary E. West College of Business Scholarship Program. “We began the Great Gala to raise needed dollars for scholarships and to keep the cost of a West Liberty University education affordable for all our students. 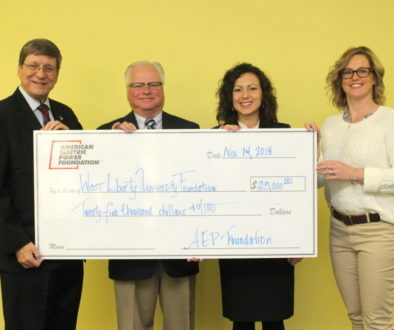 We are grateful to the community for its support and we especially want to thank WesBanco President and CEO Todd Clossin for his willingness to assist us in our effort,” said Angie Zambito Hill, executive director of the West Liberty University Foundation. “Students are always our first priority and so many of them rely on scholarship dollars. 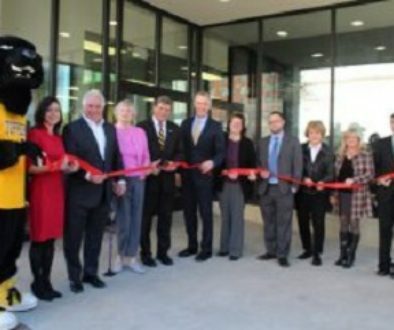 Our business students will benefit and so will the communities and organizations they serve,” said S. Michael Turrentine, J.D., Dean of the College of Business, which currently enrolls more than 300 students. General admission tickets are $150 per person or $275 for couples. Alumni are offered a special rate of $100 per person. 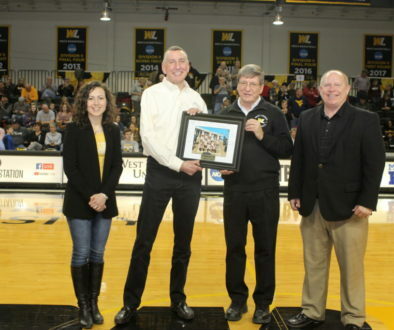 “We are hoping to see even more of our alumni this year with this new discounted rate and we know it will be a great time to catch up with old friends and enjoy West Liberty memories. I also want to mention that WesBanco employs more than 200 WLU graduates throughout its corporate footprint. We are very grateful for their constant support in this and so many ways,” Koegler added. WTRF-7 is the official media sponsor of the Great Gala and more sponsorship opportunities are available, according to Koegler. To learn more about the event, visit Great Gala webpage or contact Koegler at jkoegler@westliberty.eduor 304-336-8888.